Anytime someone stumbles or trips and takes a makes a hard or awkward landing, the chance of serious injury exists. The most common part of the body that is affected because of a slip-and-falls is the back. And everyone well knows how painful back injuries can be. The next most commonly affected body parts are knees, elbows, shoulders, hips, and ankles. When a serious Slip-And-Fall occurs and the victim sustains a head-first landing, the very same brain and spinal cord injuries as could be expected in a high-speed motor vehicle accident could be result. Just because you have fallen at a restaurant, hotel, retail store, shopping mall, automobile dealership, repair shop, or other place of business in South Florida, does not necessarily mean you have a case against the owner of that company. There is a reasonable level of caution that everyone is required to use. Crossing a city street, for example, is one very rudimentary situation in which citizens are expected to exercise basic care by looking in both directions before heading into oncoming traffic. The general rule is that a business owner cannot be held responsible for your injuries if you've tripped over an item that customarily would be expected to be there. Of course, a great number of other accidents simply cannot be avoided because of the negligent actions of a business or municipality that did not take proper care to either post a warning sign about a slippery or uneven surface -- or if shoddy materials that caused the ground to weaken and give way were used. Many other types of carelessness can contribute to a legitimate slip-and-fall case in Miami-Dade County, Broward County, and Palm Beach County. A few other situations that could give rise to a slip-and-fall case are: failure of a business owner to supply ample lighting at dusk or at night; the presence of a gaping, unsafe hole in the flooring of a business; weakened or unstable steps in a flight of stairs. Brumer & Brumer is the highly qualified, competent personal injury law firm needed by any victim of a slip-and-fall in South Florida. We have won tens of millions of dollars for our clients throughout the long and proud history of our practice, and we would be honored to discuss the merits of your slip-and-fall case. There is never a cost to meet with us, at which time we will clearly explain your options and whether we believe a financial recovery is possible. Brumer & Brumer understands as well as any lawyers in the country that many complex legal and medical components comprise a successful slip-and-fall case. We are honor-bound to share with you our candid assessment of your chances for a recovery, even if it is not the news you'd hoped for. We don't sugarcoat anything. 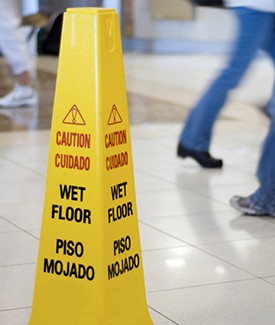 If your slip-and-fall case is meritorious, we will vigorously pursue damages on your behalf.